Ten lucky people went home with amazing raffle prizes, ranging from a guided Channel Islands Outfitters kayak tour for two on Santa Cruz Island, REI and Patagonia gift cards, CIR t-shirts and hats, passes to the Santa Barbara Botanic Garden, a signed copy of Canyon Voices by Karen Telleen-Lawton, and a whale-watching tour for two on the Condor Express! Volunteer with CIR at Earth Day Festivals in Santa Barbara and Ventura! CIR Ambassadors pose at our Earth Day Festival booth. Earth Day is just around the corner, and we're excited about celebrating at the upcoming festivals in Santa Barbara and Ventura! We are eager to share the importance of native habitat restoration and to engage the community in our work, and Earth Day presents the perfect opportunity. 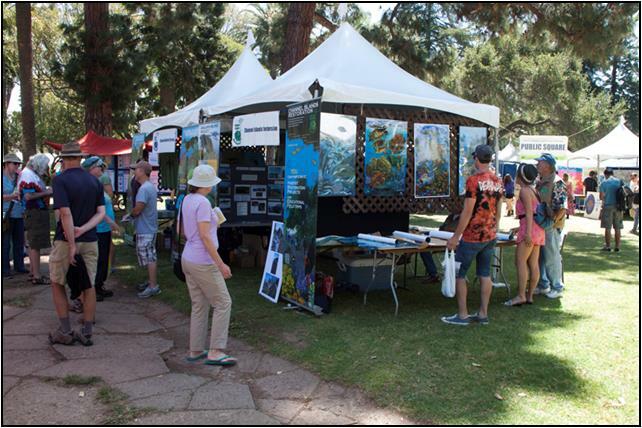 Once again, we are honored to sponsor the Santa Barbara Earth Day Festival, and we'll be setting up a booth for both days, Saturday, April 16th to Sunday, April 17th. We will also be at the Ventura Earth Day Ecofest on Saturday, April 23rd. 1969, our community and precious coastline suffered a devastating blow when Union Oil's Platform A blew-up and spilled over 80,000 barrels of crude oil into the Santa Barbara Channel. The spill was a wake-up call for many, including Wisconsin Senator Gaylord Nelson. To help avoid such an atrocity from occurring again, Senator Nelson wanted to create a "national teach-in on the environment" and, on April 22, 1970, about 20 million Americans banded together and demanded a healthy, sustainable environment for all. The tradition continues today, and CIR is proud to take up the cause. CIR booth at the Santa Barbara Earth Day Festival. CIR has participated at the Santa Barbara Earth Day for almost ten years. One of our main goals is to educate the public on the amazing landscapes, plants, and wildlife right in their backyard, and we prominently display maps, photos, and informational materials to give people a glimpse into this world. We talk to hundreds of people at these events, and many learn about the Channel Islands for the first time. Indeed, a handful of our dedicated volunteers were once curious passersby that decided to pop into the CIR booth. Earth Day events are incredibly important to us, but they are a lot of work! We increasing rely on volunteer "ambassadors" to help us staff the booths. Being a CIR ambassador at Earth Day is a wonderful opportunity to share your island stories and encourage the public to get involved and experience the magic of the Channel Islands themselves. For those who have only begun volunteering with CIR, fear not! We always make sure to pair less experienced volunteers with long-term volunteers, or CIR Board members, so no one will feel overwhelmed. Become a CIR Earth Day Ambassador! Join CIR and hundreds of other environmentally-friendly organizations at any of the many Earth Day celebrations happening in April in Santa Barbara and Ventura County. The Earth Day celebrations are CIR’s best opportunity to reach out to members of the public who want to become involved with environmental conservation. In fact, many of our volunteers first heard about CIR at an Earth Day event. Earth Day began when Wisconsin Senator Gaylord Nelson witnessed the ravages of the 1969 oil spill in Santa Barbara. The first event took place in 1970 when 20 million Americans all over the country demonstrated for the environment. It has since become a global event, held on weekends and centering on April 22nd, the anniversary of the first Earth Day. 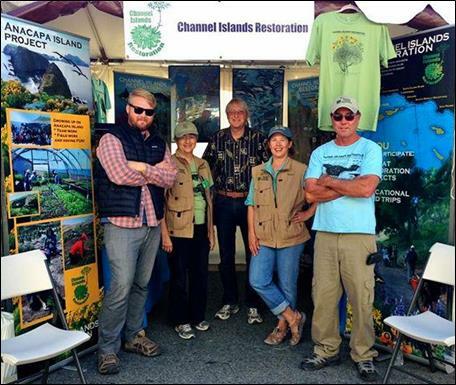 CIR has participated at the Santa Barbara Earth Day event since 2007, and our booth has evolved from a couple of simple displays into a showcase of habitat restoration work on the Channel Islands and mainland. We prominently display maps and photos of the Channel Islands and talk to hundreds of visitors throughout the two-day event. CIR Board member Cindy Kimmick provides a fascinating display of vertebrates for young people and adults alike, and many people learn about the Channel Islands for the first time at these events. The Santa Barbara event features two full days of live music, speakers, family activities and interesting exhibitors, including many environmental non-profits. CIR has become a contributing “sponsor” of this very worthy event. Since these events keep us very busy, we increasing rely on volunteer“ambassadors” to help us staff the booths. We pair less experienced volunteers with experienced ones or CIR Board members, so no one will feel overwhelmed. Being a CIR ambassador at Earth Day is a lot of fun, and it’s a great opportunity to share your experiences of the islands and environmental volunteerism with the public. We even provide soft drinks and snacks to those who help out.